Bill is one of the Dynamo pups. His momma, Sandy, was rescued with her four puppies by the staff of the Dynamo. They took great care of Sandy and her babies while they waited for a foster. Sandy even got to run the practice field with the team. Bill is a big cuddle bug. He wants to be held while he sleeps. He sits at his foster dad’s feet and grunts until he’s picked up at which point he makes himself comfy and promptly falls asleep. Bill also loves to wrestle with his brother. Bill also loves water. While his brother, Freddie, likes to sleep behind the water bucket, Bill prefers to get IN the water bucket. So far, none of his siblings have complained about puppy fuzz in their drinking water. Dock Diving is a dog sport in which dogs compete in jumping for distance or height from a dock into a body of water. A team consists of one dog, of any type or size, and usually one handler but sometimes two handlers. Dogs must be over six months of age to compete. Handlers may use a toy, also known as the chase object. The dogs are not required to chase or retrieve the toy. If you are interested in having your dog try it, check the Dockdogs table for information. Saturday, March 29 will be a very popular and exciting event called “The Quadruped.” It is a long distance competition, featuring two divisions (Men and Women). There will be Frisbees flying almost 100 yards in the Men’s Open division and over 70 yards in the Women’s Open division. Sunday, March 30 will be The Ashley Whippet Invitational. Flyball is a dog sport in which teams of dogs race against each other from a start/finish line, over a line of hurdles, to a box that releases a tennis ball to be caught when the dog presses the spring-loaded pad, and then back to their handlers while carrying the ball. 11:30am, 1:30pm, 3:30pm Pets Overboard! PM Productions Entertainment from Florida will entertain furry fans (and their owners) of all ages with performances of “Pets Overboard!” This popular local show was created in 2006 as a stage show, featuring animals rescued from local shelters. It is a high-action, exciting show with fun for everyone. The pirate-themed show comes complete with scenery, costumes and a double-level elevated stage. This canine cast has performed at theme parks, county fairs and festivals across the country! Save Pups Before They Reach Shelters. Ellie’s plight is a typical one for many street dogs. Most likely she would not have survived much longer but she had already contributed several times over to the cycle of reproduction that puts more and more unwanted puppies on the streets. Ellie’s recovery was not fast or inexpensive and she spent several months in foster care before she could be put up for adoption. She is now a sweet, healthy girl who loves her toys and especially dinnertime. Ellie’s story has a happy ending, but that is not the case for many of the momma dogs that find themselves in her situation. We need your help to rescue mommas like Ellie and break the cycle that puts more dogs out on the streets and in shelters. 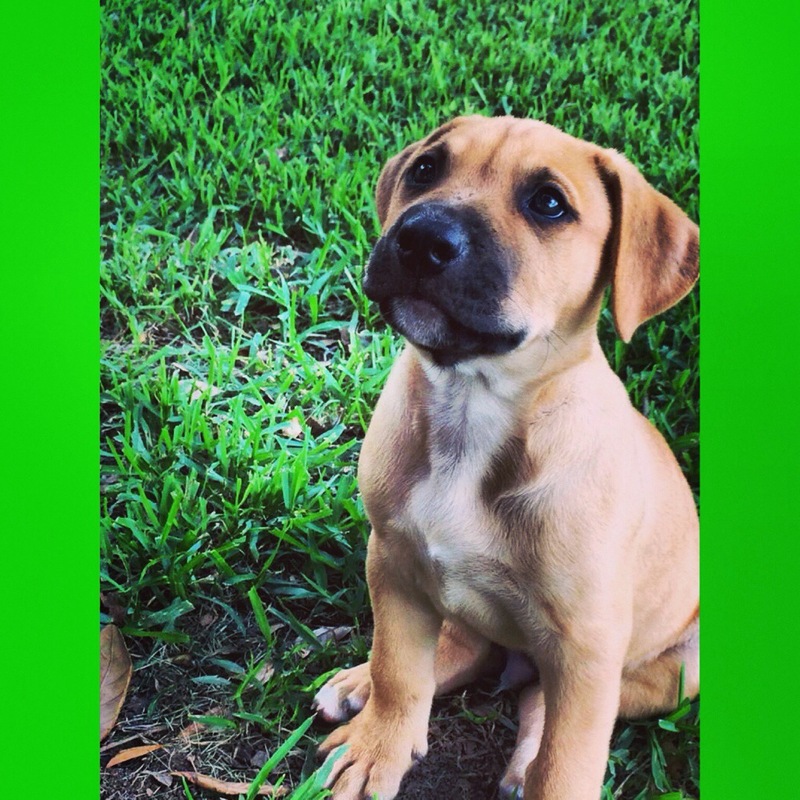 We ask that you consider a monthly donation, however big or small, which can have such a long lasting impact for the pup population in Houston. Who else is SUPER excited for tonight’s Martinis for Mutts?? We certainly are! Join Pup Squad TONIGHT for drinks, hors d’oeuvres, and a fantastic silent auction/raffle! Tickets are available for purchase now at the Pup Squad website or get yours at the door! 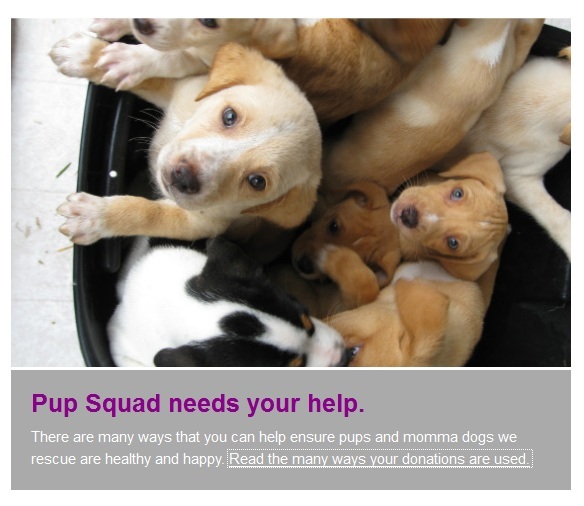 Pup Squad needs your help. If you’ve ever rescued a stray or even had a dog of your own, you certainly know- properly caring for your pet can get expensive at times! Most of the funds Pup Squad is able to raise through generous donations and adoption fees goes toward veterinary costs- spaying, neutering, heartworm treatment, vaccinations, etc- because as I’m sure you all suspect, most of the dogs and pups who are a part of Pup Squad, don’t start off healthy. Regular donations are so important to the well-being of the animals in our care, so Pup Squad has recently launched a completely revamped donation page on the website, as well as kicking off an email campaign to let people know about our new recurring donation option! 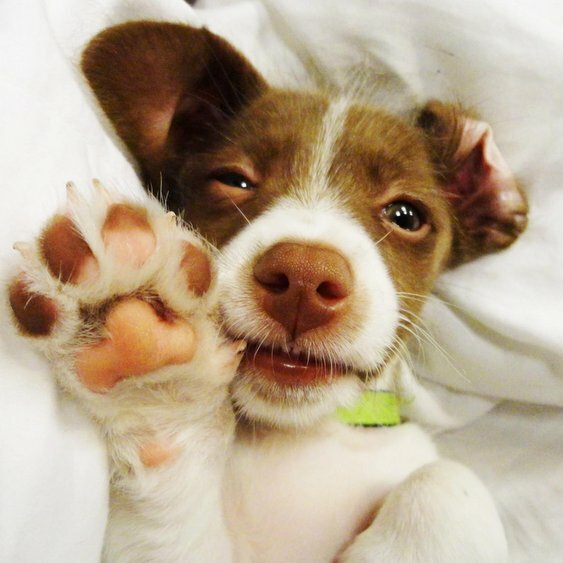 For $5 a month, or the cost of one coffee, we can spay or neuter one puppy to ensure a manageable future pet population. For $20 a month, or the cost of 4 drive-thru lunches, we can put a momma dog through lifesaving heartworm treatment. Pup Squad couldn’t continue helping momma dogs and their pups without donations from our generous supporters, and we’re really excited about our new $5, $20, and $40 recurring donation options. With your help, Pup Squad will be able to look forward to helping even more dogs and pups in need! If you’re able, visit our donation page and signup for a recurring donation today! *If left to their own devices, in 5 years one unneutered male and one unspayed female dog can begin a cycle that will create as many as 12,000 puppies.